The Festival was based at the University of Surrey, with events in Guildford and the surrounding areas. The Quekett hosted a drop-in family event in Guilford High Street on the 5th and 6th September as part of our microscopy outreach programme. On both days of the exhibition, the magnifiers and simple microscopes were displayed with a variety of samples to look at. Those which had the biggest ‘wow’ feature were samples of newspaper pictures, feathers and diseased leaves. Even our youngest visitor had a look through the large ‘Sherlock Holmes’ type magnifying glass, though they were often more interested in looking at their siblings features with it! The pocket microscope generated lots of interest both with kids and with grandparents looking for potential Christmas presents. There were also displays of more complex microscopes, with club members showing more samples to look at using more specialised microscopes. The Quekett exhibition included some simple magnifiers and microscopes. They can put it onto almost any surface, and the working distance is correct to give a sharp image. The low magnification, in this case ×6, means that they can look at familiar objects and see detail they haven’t seen before. 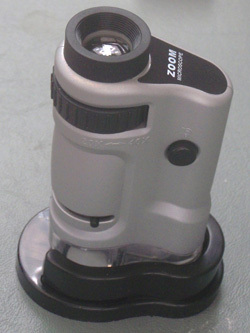 The magnifiers only provide modest magnification, however, and the next step is a simple microscope. Members have been impressed by a pocket microscope sold by the Natural History Museum shown below. This gives magnifications of ×20 and ×40 and has a small built-in LED illuminator. The base can be removed and the microscope put directly onto a surface to see the detail. Alternatively, with the base in place a sample can be put onto one of the supplied small plastic microscope slides and slotted into a holder in the base. 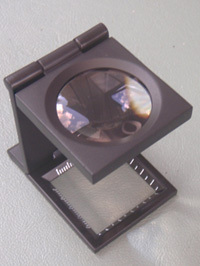 The LED light illuminates the sample at an oblique angle from above, but can pass through the slide and reflect back from a white base plate through the slide to provide transmitted-light illumination. Graham Matthews brought along a sample of pond water from his local nature reserve. In this were live micro-organisms called Daphnia. We could see these swimming around in the water sample he put onto his microscope – his method of preparing the sample slowed the movement down sufficiently to allow us to see it. 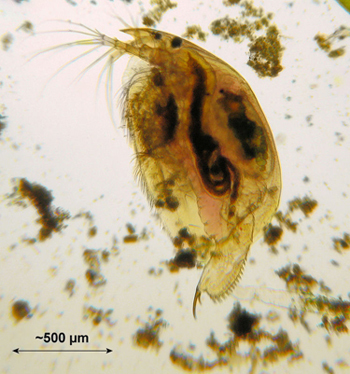 For more information about pond life and Daphnia, look at Graham’s website www.micromagus.net. Maurice Moss brought along two different but related samples. His collection of slides included a number of mounts of butterfly wings. These showed beautiful iridescent colours when illuminated with a bright light. 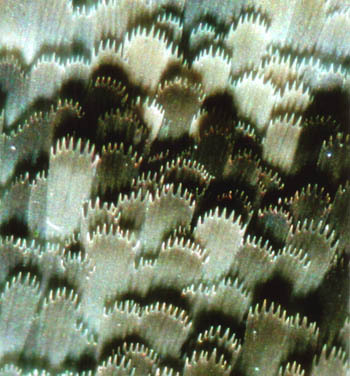 With the microscope, we could see the scales which form the wings – each of which acts as a small plate which interacts with light. It is this complex interaction of light which produces the colours we see. You can see the range of colours in butterfly wings at the Natural History Museum. Maurice also brought some other samples to illustrate the way that light interacts with things to give colours. He showed that the type of polariser we have in polarising sunglasses can modify the light. If this light then passes through a piece of Cellophane and through a second polariser, we see very bright distinctive colours. Adding more layers of Cellophane and twisting a sheet around can give completely different colours. For an explanation of this, there is an article on The Magic of Polarised Light, by Don Thomson on the Club’s website. Lewis Woolnough and James Rider showed a variety of crystal forms. Lewis had a simple polarising microscope to show the formation of crystals. He used citric acid, made a strong solution and put it onto a microscope slide. It may be necessary to heat the slide slightly to start it off, but at some point crystals start to form. They can form very quickly, or more slowly as we showed in the recorded images by Ven Dodge on the computer screen. The atoms in the liquid organise themselves to form the crystal structure and these interact with the light which as been constrained by polariser to give a pattern of beautiful colours. Some people make this type of work into an art form, producing high quality photographs which are sometimes used as the background to graphic art. Artists can be inspired by the patterns formed, and we showed a picture titled ‘Landscape’ where the crystal shapes mimicked a lakeside scene. James brought along one of his superbly preserved veteran microscopes to show the quality of the images obtained on a research type microscope. Phil Greaves had a video camera fitted to his microscope so he could display live his interesting micro-organisms called Tardigrades or ‘water bears’. These are very distinctive, with little feet and a round body shape, and are usually found in mossy areas. There is more information on these at www.baertierchen.de/main_engl.html.